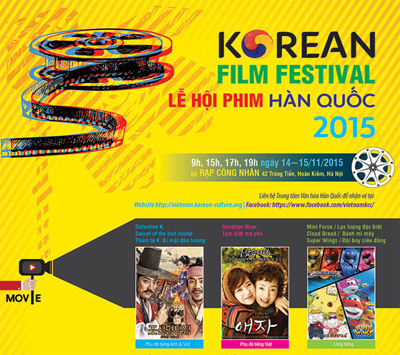 The South Korean Film Festival will feature motion pictures and animated movies at Ha Noi's Cong Nhan Theatre this weekend. Two movies are scheduled, Detective K: Secret of the Lost Island and Aeja (Goodbye Mom), along with three animated movies, Cloud Bread; Super Wings and The Strong and Mini Special Forces: The Attack of a New Villain. Produced by Kim Seok-yoon in 2015, Detective K: Secret of the Lost Island is the latest film to be screened at the festival. It features the 18th Century Korean sleuth on a new mission to foil a plot to wreck the flourishing economy of the Joseon dynasty. Already a hit in South Korea, where it opened over February's Lunar New Year holiday, it is the sequel to the 2011 Detective K: Secret of Virtuous Widow, which blended adventure and comedy. Produced in 2009, Goodbye Mom became number one at the box office, seen by nearly 400,000 during its first five days. The film depicts the most complicated of relationships: mother and daughter. The animated movies are blockbusters in South Korea. "They are both educators and entertainers, promising to satisfy young audiences," said Park Nark-jong, director of the Korean Cultural Centre. "I hope this year's film festival will be an interesting destination for Vietnamese audiences of different ages who seek to learn more about Korean culture". Free tickets can be picked up at the centre, 49 Nguyen Du Street./.